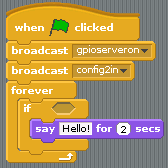 The version of Scratch included with the Raspberry Pi has a number of unique features; one of the most useful is its ability to communicate with the GPIO pins (General Purpose Input Output). 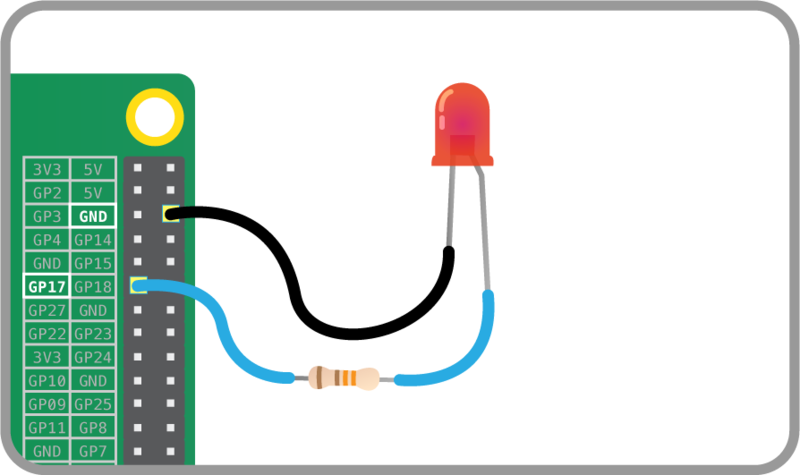 These pins allow you to connect your Raspberry Pi to a range of devices, from lights and motors to buttons and sensors. One powerful feature of the Raspberry Pi is the row of GPIO pins along the top edge of the board. 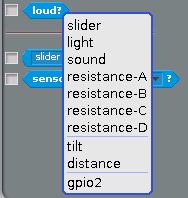 GPIO stands for General-Purpose Input/Output. These pins are a physical interface between the Raspberry Pi and the outside world. At the simplest level, you can think of them as switches that you can turn on or off (input) or that the Pi can turn on or off (output). 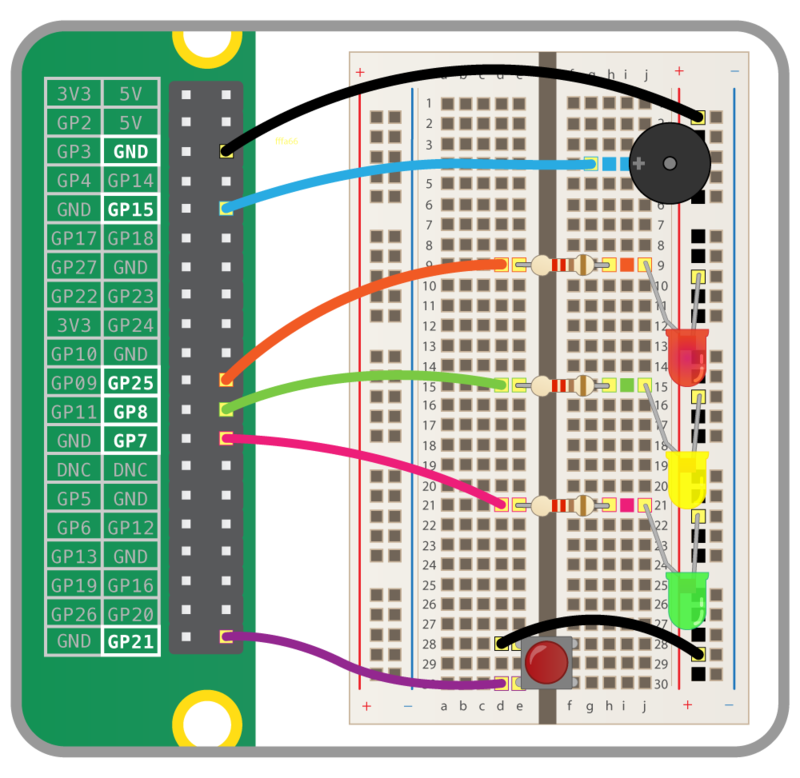 The GPIO pins allow the Raspberry Pi to control and monitor the outside world by being connected to electronic circuits. 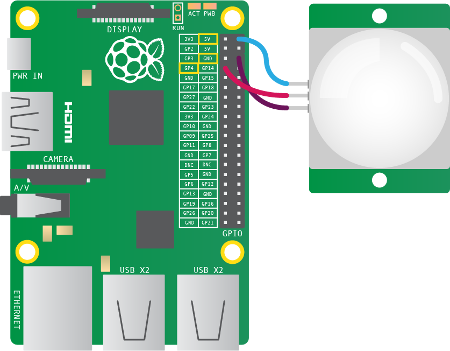 The Pi is able to control LEDs, turning them on or off, run motors, and many other things. It’s also able to detect whether a switch has been pressed, the temperature, and light. We refer to this as physical computing. 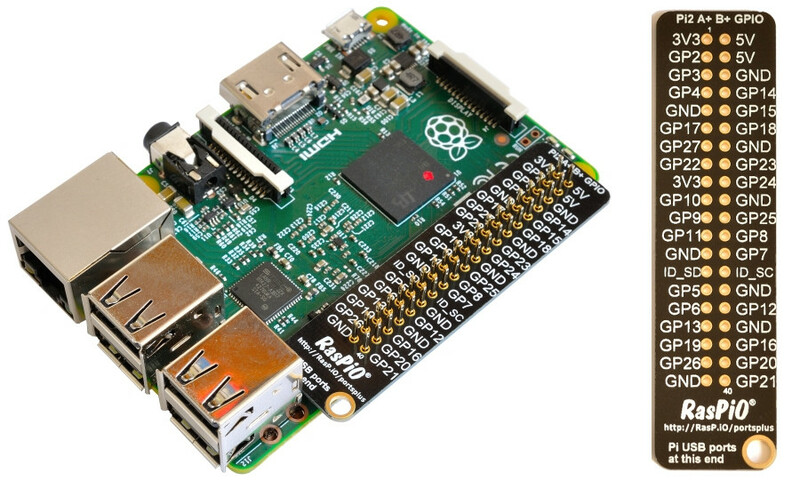 There are 40 pins on the Raspberry Pi (26 pins on early models), and they provide various different functions. If you have a RasPiO pin label, it can help to identify what each pin is used for. Make sure your pin label is placed with the keyring hole facing the USB ports, pointed outwards. WARNING: If you follow the instructions, then playing about with the GPIO pins is safe and fun. Randomly plugging wires and power sources into your Pi, however, may destroy it, especially if using the 5V pins. Bad things can also happen if you try to connect things to your Pi that use a lot of power; LEDs are fine, motors are not. You can test whether your GPIO pins and LEDs are working by building the circuit below. You can use any resistor over about 50Ω. The LED is connected directly to the GND pin and the 3V3 pin via the 330 Ohm resistor, and should light up. To control the LED, you’ll need to adapt your circuit to use a switchable pin. In the diagram below pin 17 has been used, but you can use any numbered pin you wish. 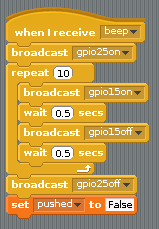 Locate the Scratch program by clicking on Menu followed by Programming, and selecting Scratch. As well as controlling the physical world, you can react to it using an input device such as a button. 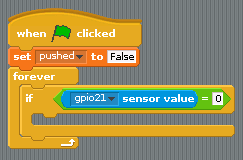 Before Scratch can react to your button, it needs to be told which pin is configured as an input pin. 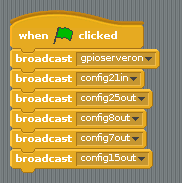 Once you have built the code above, you need to click the green flag in order for it to run and for your pin to be set up. Now when you press your button, the state should change from 1 to 0. Now that your button is all set up and working, you can make it do something. You can start off by making it control a sprite. If everything is correct, your button should make the sprite speak. To finish off, you can combine your two programs so that the button can turn the LED on and off. Now when you push the button, the LED should light up. There are two main types of buzzer: active and passive. A passive buzzer emits a tone when a voltage is applied across it. It also requires a specific signal to generate a variety of tones. The active buzzers are a lot simpler to use, so these are covered here. An active buzzer can be connected just like an LED, but as they are a little more robust, you won’t be needing a resistor to protect them. Humans and other animals emit heat all the time. 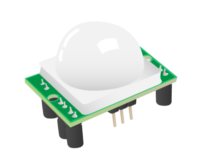 A PIR sensor detects changes in the amount of IR radiation (heat) it receives. When there is a change, then a pulse is triggered. This means that a PIR sensor can detect when a human (or any animal) moves in front of it. The pulse emitted when a PIR detects motion needs to be amplified, and so it needs to be powered. There are three pins on the PIR; they should be labelled Vcc, Gnd, and Out. If these labels aren’t clear, they are sometimes concealed beneath the Fresnel lens (the white cap), which you can temporarily remove to see the pin labels. As shown above, the Vcc pin needs attaching to a 5V pin on the Raspberry Pi. 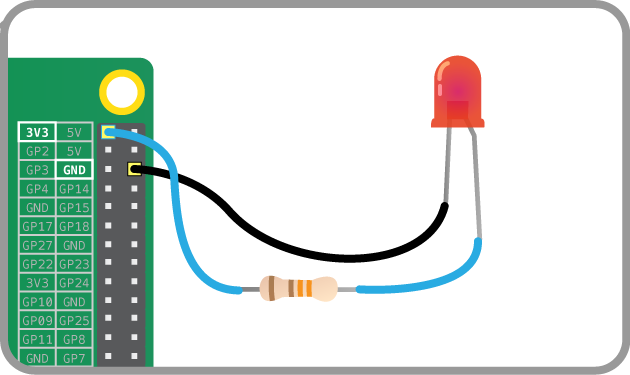 The Gnd pin on the PIR sensor can be attached to any ground pin on the Raspberry Pi. Lastly, the Out pin needs to be connected to any of the GPIO pins. With your PIR circuit complete, you are now ready to use Scratch to sense motion. 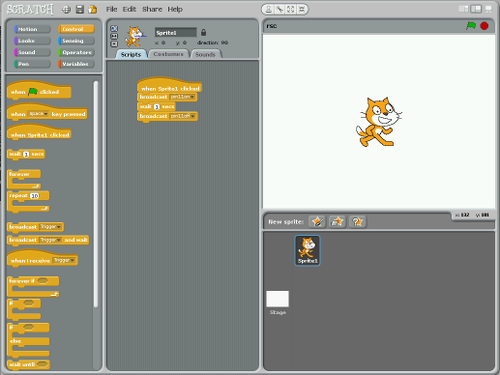 Launch the Scratch program by clicking on Menu followed by Programming and selecting Scratch. Our version of Scratch on Raspbian is extra special. 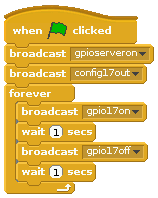 It allows you to access and control the GPIO pins. Click on control in the top-left display. Drag the block onto the scripts area. 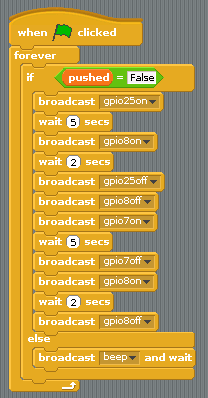 Drag a broadcast block to your scripts area and attach it to the block. Click on the drop-down menu on the broadcast block and select new. Type config4in in the message name box. 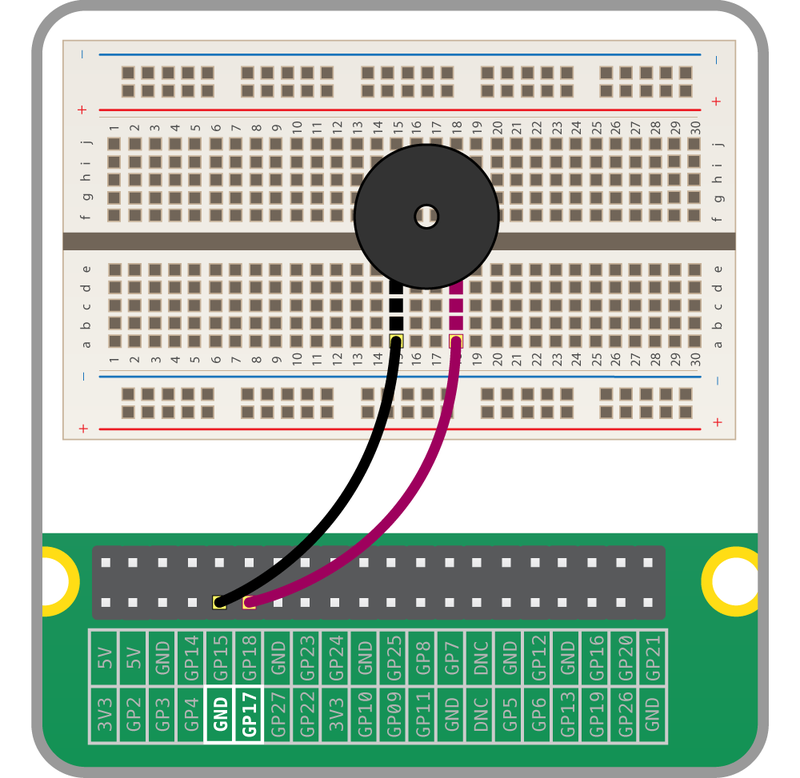 This instruction will tell the Raspberry Pi to set GPIO pin 4 as an input. 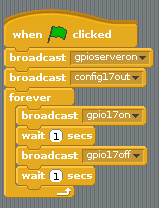 Press the green flag in the upper-right corner of the Scratch window. This executes the instruction to set GPIO pin 4 as an input. 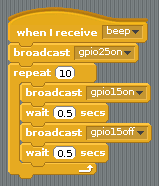 Scratch uses the ‘Sensing’ blocks to check if there is any input on the GPIO pins. If there is an input, the value of the pin changes from 0 to 1. 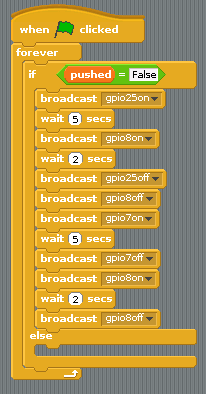 As you connected the PIR sensor to GPIO pin 4 of the Pi, we need to monitor that. 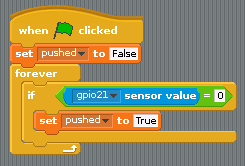 Click on the drop-down menu on the sensor value block and choose gpio4. Tick the checkbox to the left of the block to display the pin value on screen. Test the PIR sensor by waving your hand in front of it. When it detects movement, the value on the screen should change from 0 to 1. If the value doesn’t change, check that the correct pins are connected. For this worksheet you’ll need a breadboard, three LEDs, a button, a buzzer, and the necessary jumper cables and resistors. You can purchase these individually, or get everything you need in the CamJam EduKit. To get started, you’ll need to place all the components on the breadboard and connect them to the Raspberry Pi. To save on using 5 different ground pins, you can just plug a single GND pin into the negative row on a breadboard. This is called a common ground. Open Scratch and save a new file. Now you can create a basic traffic light sequence. The sequence for traffic lights is Red–>Red/Amber–>Green–>Amber, and constantly repeated. This is the perfect excuse for a loop. Test out the light sequence by clicking the greenflag. Test out the sequence, and then try pushing the button. The traffic light sequence should finish and then stop. To help the visually impaired, a crossing normally beeps when it is safe to cross. And now you should have a working traffic light and crossing, all in Scratch!